I’d had my eye on a fitness activity tracker for a long time but some were just so expensive. 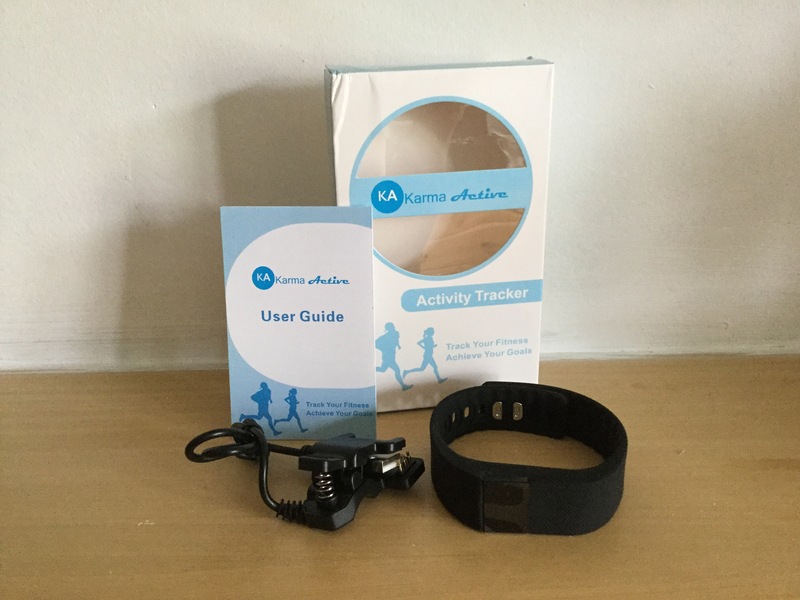 I got the opportunity to review the Karma Active Super Charged Activity Tracker. I have been using it for a couple of days and I am really liking it. 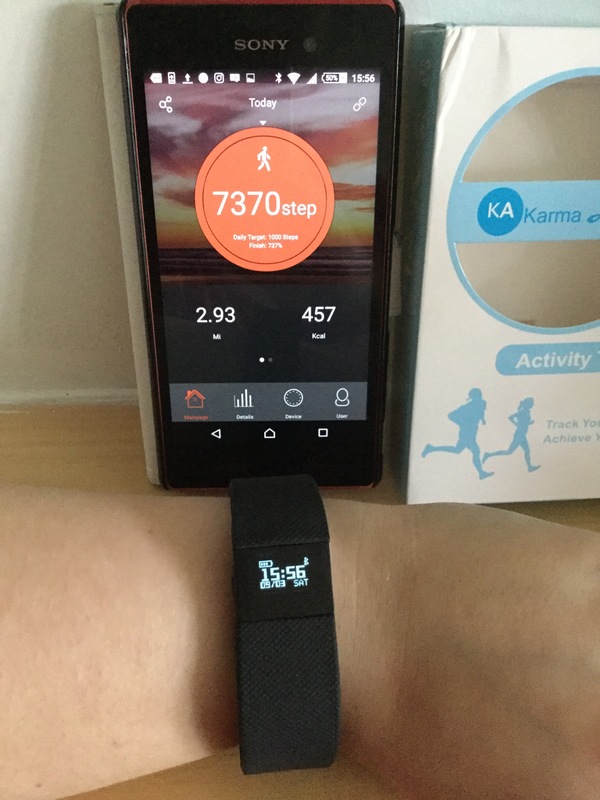 The Karma Active Super Charged Activity Tracker came in a small white and baby blue box with a window that shows you the tracker. On the back of the box, there is a list of the functions that the Karma Active Super Charged Activity Tracker has. 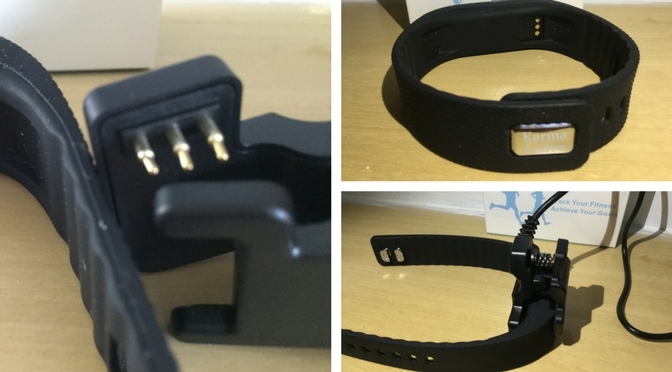 The tracker is a soft rubber band with the tracker device attached. It has a small metal plaque at end of the band with the brand name on. The fastening is a press fastening; as a short description, it is similar to a press stud but metal through the rubber. There is a single button on the side to cycle through the functions on the band. The charging port isn’t a typical ‘push in‘ connection. It is a USB cable with a clip fastening with 3 metal prongs. These prongs must be attached to the connection on the inside of the tracker. After charging your tracker, the next thing you must do is download the Veryfit 2.0 app from the Google Play Store or iTunes. Don’t worry, it is a free app. Once downloaded ou have to turn your Bluetooth on and it will find your tracker device, ready to pair. It will sync all your details from your tracker to your app in a few seconds. If you also notice that the tracker’s date and time are wrong before you sync with the app, don’t worry as it updates it over Bluetooth. You have to run the app set up and set your height, weight, age, gender and daily step and sleep targets. So, what functions does this Karma Active Super Charged Activity Tracker have? On the tracker device you have a pedometer to track your steps, calories burned estimation, distance walked and a watch. To view each of these, just press the button on the device to cycle through them. The numbers on the device are also extremely easy to read. Obviously, it can’t be 100% accurate but the manual says it is roughly 95%. I didn’t realise I moved so much in a day! You also have a sleep monitor which tracks how long you have been in light or deep sleep and how long you stayed awake for between the time you activate sleep mode until you deactivate it when you wake up. To activate/deactivate sleep mode you just hold the button on the tracker instead of a single press. There is an anti-lost alert, which vibrates if you go a certain distance away from your Bluetooth signal, which is roughly 5 metres and also vibrates for other alarms which you may set too. You can set an alert that tells you if you have been sedentary for over 30 minutes. Battery life… I gave this a full charge before I used it, which it recommends that you do and it only takes roughly 20 minutes. After having the tracker connected to my Bluetooth constantly since then I still have 66% battery left on my device so it seems a pretty good battery life. The details of the item say the battery could last you about 7 days. There is also an option take photos on your phone remotely. You have to open the camera on the app and to take a photo you just click the button on the tracker. I really like this activity tracker. It is easy to use and gives you plenty of functions to work with. It is an amazing bargain! I’d definitely recommend to anyone looking for an activity tracker to try the Karma Active Super Charged Activity Tracker. The activity tracker is currently unavailable for sale at Amazon UK but has previously been available for £26.49. You get a 12-month warranty when you buy the activity tracker. I’d love to hear your opinions. Feel free to get in touch. I’m not sure where mine is at the moment Alyson, I’m sorry. Maybe I could help you with information if you need it?